We are happy to announce our ClausNet Featured Member for March 2019 is Drosselmeyer! 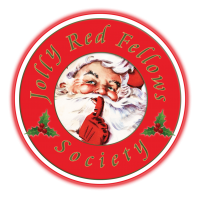 Community Reputation (as of today): 1858 – Darn near Santa himself! Drosselmeyer: "As much as she hates to admit it, it is all my wife's fault! 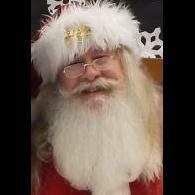 She called me one afternoon when we were dating - I think 1996 or 1997 - and told me that she had volunteered me to be Santa for her company's children's Christmas party. They had a musty old corduroy suit and a really awful beard, but over 100 kids were there (or so it seemed) and we had a lot of fun. I was hooked! I did that party for the next several years. 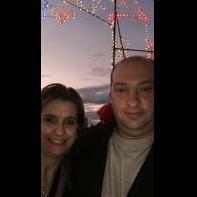 I also ended up doing some visits for friends, and also for the local Longaberger Christmas events. My mother made me my first real suit. For several years I just did it as a thing for friends and family - primarily our annual Christmas party. My son didn't know it was me until he was 10! Of course, he is now my trusty reindeer herder. When I went to sign up to join the local fire company, the interviewer looked at me and said: "Well, you have a beard, and we need a Santa with a beard, welcome to the team, you are our new Santa." 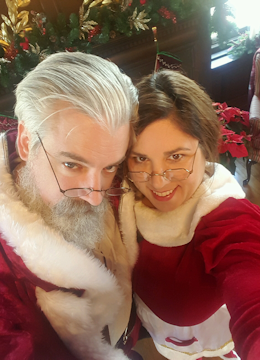 The next year my wife got a call from a friend who did events for the local radio station, and the next thing I knew I was Father Christmas at the Old-Fashioned Christmas at the local DuPont estate! This year just went off the rails. 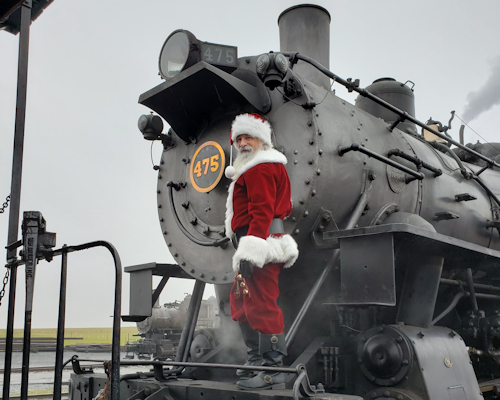 I was asked to be Santa for the historic steam railroad up in Lancaster, and then also got called to do breakfast with Santa at the nearby conservatory and gardens in Kennett. I am already getting calls for this season. It just keeps going!" Drosselmeyer: "I like to draw from a lot of different sources. I have found costume or accessory inspiration in some pretty random places. I like the Sundblom Santa, but that style just doesn't fit my personality. I have always seen Santa as a little more rustic and active, I like the old-European style Father Christmas. I appreciated the workshop Santa costume of George Buza, and Kurt Russell certainly had a different take on the look. As for character - my all-time favorite Santa is by Douglas Seale - for me he expressed the passion and love that defines who Santa is." Drosselmeyer: "I get to make people happy. Younglings get excited, but even the older children's eyes will light up when Santa comes by to have some fun. You can have a positive impact on so many people. I can think of a couple little boys who yelled up to me on the firetruck and asked me if I would dab. I did. They went wild. ‘Santa really did it - that is so cool!’ I also remember a few times on the train when I would ask a child if Grandpop was being good - almost always they would giggle and say no - at which point I would excuse myself and step to the back of the car and get a lump of coal out of the scuttle and bring it up and give it to Grandpa and tell him to try harder - the kids would just explode. I had one Grandpop chase me down the car and thank me profusely for the lump of coal - he really meant it. Just being a little spontaneous and meeting people where they are and helping to make them happy is a wonderful thing." Drosselmeyer: "I can think of two visits that really made an impact. The first was for a friend whose daughter had just had hip surgery. She was stuck at home in a wheelchair and couldn't go out. Mom and Dad left a few things on the front porch for Santa to slide into his sack. I hadn't shaved in a few weeks, and didn't feel like it that day, so I just brushed clown white into my short beard. We showed up on a bleary Saturday afternoon. I think her eyes almost popped out. I got to sit with her, and she just kept talking - telling me about her hip, and how her sister was silly, and how her brother was a pain, and what she wanted for Christmas - she just kept talking. 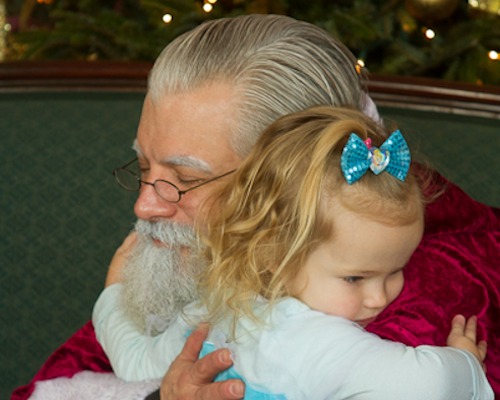 At one point she reached up and touched my beard and said: ‘it's real - you really are Santa!’ I am happy to say she did get better, and I have not been clean shaven since. The other visit was later that same year. My parents live just down the street from us, and my Mom had a 50th reunion Christmas party for her high school class. She asked if Santa could make an appearance. I stopped by and just kind of worked my way around the rooms having fun with everyone. My Mom noted one lady who was sitting back in the corner - she had MS and was having a hard time getting around. I went over and sat next to her and spent some time with her and she just lit up. My Mom told me later that she was just giddy - not that ‘your son’ or ‘that guy’ came over, but that Santa came to sit with her. The fact that I went to her made all the difference. It doesn't take a lot to make someone." Drosselmeyer: "I don't think I could name a favorite. It's hard to beat standing on top of a firetruck running lights and sirens waving to everyone but riding on a steam train is pretty awesome too. 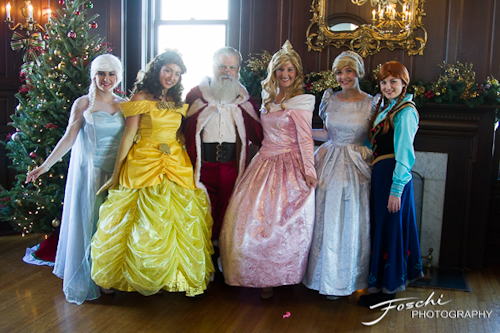 We have also been able to do some special breakfasts with Santa at a few of the local DuPont estates, and the tea parties with the Princesses is a blast! 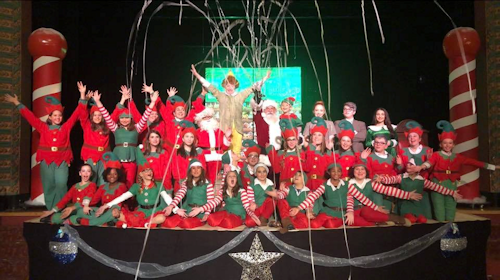 Appearing at the theater this past year in tandem with the Elf, Jr. production was over the top! I do enjoy the venues I can go to with my wife - it's always nice to have Mrs. Claus by my side." Drosselmeyer: "I have already been blessed with a lot of fun options - but if I had unlimited funds and opportunity I would like to get a farm where I had space. 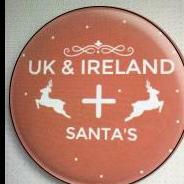 Maybe a few reindeer. Now I'm starting to sound like a Hallmark movie! My wife and I enjoy entertaining and having a place like that to decorate and have folks in over the holidays would be great! 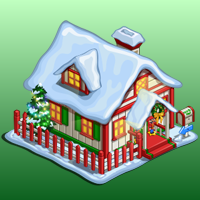 Just imagine a big country barn all lit up and folks going for sleigh rides and warming up by a bonfire." Drosselmeyer: "I am a Chiropractic Physician and Licensed Acupuncturist. In addition to my practice I serve on a few professional boards. I am also the DE delegate for the American Chiropractic Association. I usually clock about 60 hours on my normal work week, so that tends to keep me out of trouble." Drosselmeyer: "I have a bad habit of getting involved. I am all over the place. I pursued my EMT, but with the beard I don't get to ride so I serve as Chaplain for the fire station. I also head up the security team at my church. I usually help out teaching the children's karate classes on the weekends. My wife and I just auditioned for roles in Mary Poppins, and will be filling a few character roles in that production in two months." Drosselmeyer: "I'm usually in the Johnny Cash black category." Drosselmeyer: "Fried chicken. Ham steak. Scalloped potatoes. Pecan pie. Rocky Road ice cream." Drosselmeyer: "Chocolate Chip - crunchy cookie - soft chunky chips." Drosselmeyer: "I like westerns, so Dances with Wolves, Tomstone, or Lonesome Dove." Drosselmeyer: "That's easy! Ernest Saves Christmas! Hands down one of the best Christmas movies ever. Yes, it's Ernest and he's totally goofy, but I am challenged by the way Douglas Seale presents a devotion to what Christmas is - what it needs to be. From the customs agent, to the business man, to the children in the airport he is recognized maybe not directly as Santa, but as someone special. 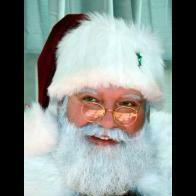 Just by being in jail Santa is able to get all the other inmates to promise to be good. His replacement is so concerned for children that he can't say bad words - not because the kids haven't heard them before - but because they have never heard him say them before. Even Ernest has a Keep Christ in Christmas bumper sticker in his car. 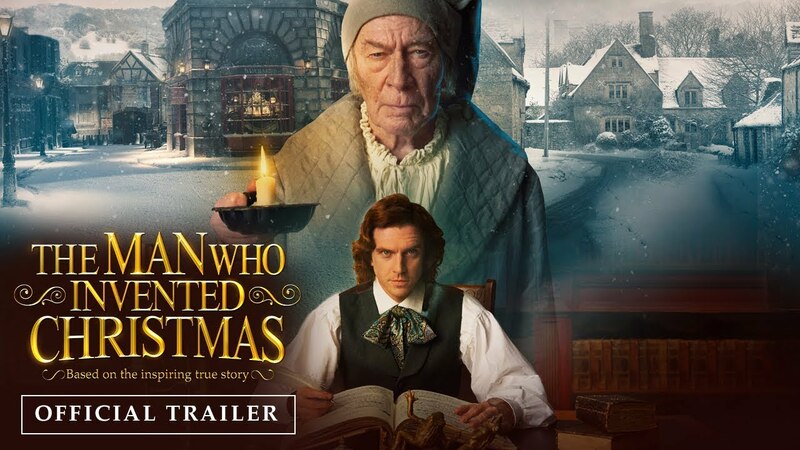 At face value it's just a goofy Ernest movie, but there is definitely some Christmas magic, a little bit of faith, a little bit of whole lot of Christmas feel good." Drosselmeyer: "Christmas music has been a part of my family for as long as I can remember. My Dad's father had an extensive collection of Christmas music, and my Dad would always start playing some albums by the start of the school year. 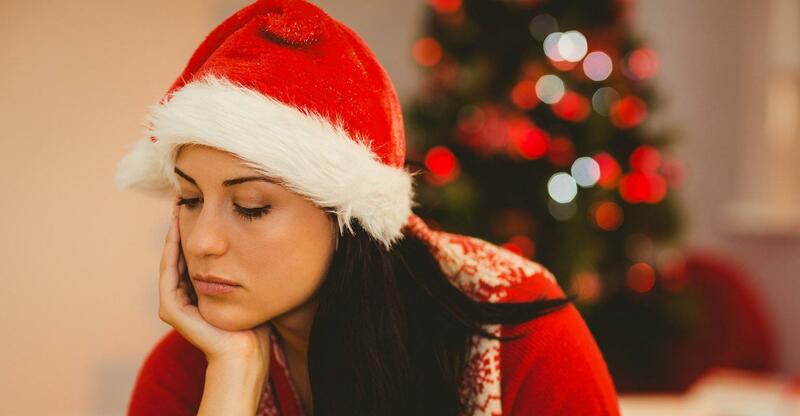 So, Christmas music is hard-wired in my brain. I listen to it almost all year round. 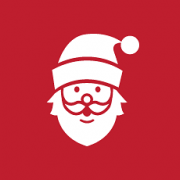 We have well over 2000 Christmas tracks in the iTunes library! There are way too may songs at the top of my list: Hallelujah Chorus by the original Young Messiah, Cowboy's Rocky Mountain Christmas or Merry Christmas Mary by the Flying W Wranglers, Home for Christmas by Steven Curtis Chapman to name just a few. But David Phelps did a track called Joy, Joy - which my son also performed at church - right now that is at the top of my playlist." Drosselmeyer: "This Life I Live by Rory Feek and The Immortal Nicholas by Glenn Beck." Drosselmeyer: "If I could, I would love to ride off into the sunset. To be a working cowboy in the old western tradition." Drosselmeyer: "Bank teller in Alaska - everyone is wearing ski masks! But seriously, I couldn't do a cubicle desk job - my brain fogs over. I need to be up and active. To be stuck in front of a monitor in a little box would drive me insane." Drosselmeyer: "I had GI Joe - the real one with the action grip - and Action Jim. I always played with Hot Wheels. Of course, I had Legos and Micronauts too. When I was young, we lived in southern Texas near the Louisiana border. When it rained our yard would always flood and we had thousands of little marsh frogs appear - those were also a lot of fun to play with - although my mom didn't find them nearly as interesting as I did." Drosselmeyer: "I was the oldest grandchild by almost 10 years, so I was in on the magic for the younger cousins. I can remember my grandfather putting on a beard and going out in the yard and knocking on the windows to surprise my cousins on Christmas. I don't remember if he ever did it with me, but I do remember him coming in after his outing just smiling and laughing to himself. 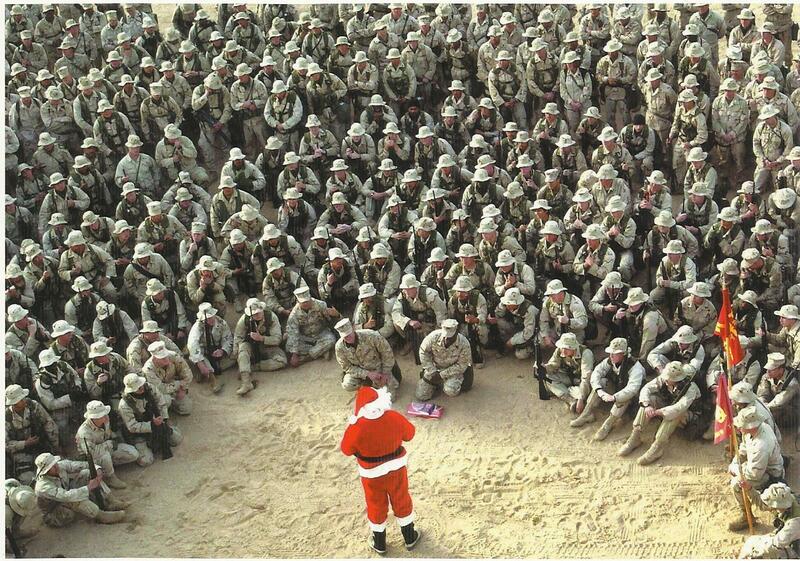 All my cousins would run to him and ask if he had seen Santa outside. He would say ‘No. Of course not. Was he here?’, and they would tell him how they just saw Santa out in the yard waving to them. He would just smile and look at me and wink - I was in on his special secret and that made me feel pretty good too." Drosselmeyer: "This last year I had a boy at the fire house ask me for a new washer and dryer for his parents - that was all he wanted. That one caught me off guard and his mom or dad wasn't there to give me any input. I think I said something to the effect of ‘my goodness - how will I fit that in the sleigh?' and then tried to redirect to him, but as quickly he shared his request he jumped up and ran off before we had a chance to talk more. I didn't see him again that whole." Drosselmeyer: "I had a boy ask me for a parachute this past year - no explanation - he just wanted a parachute." Drosselmeyer: "I seem to have existed in a Santa vacuum for a long time. 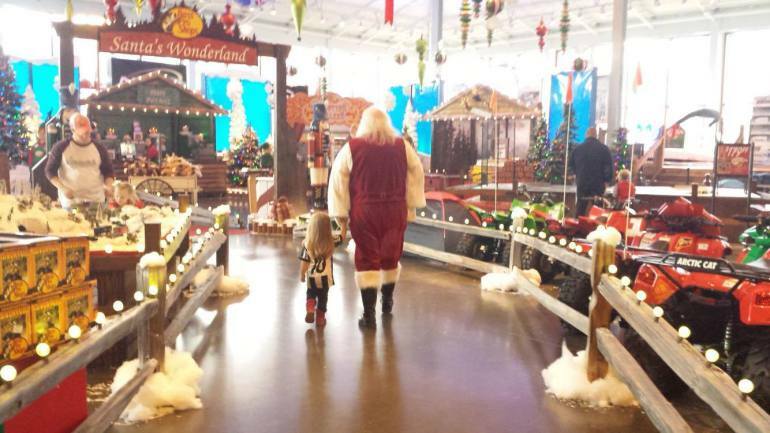 It just never occurred to me to look for Santa stuff online until about two years ago when I met a friend at a neighboring fire station who told me about going to Santa school. I had no idea there was such a thing. As I went online and started looking, a whole new world opened up to me. There were Santa schools. There were resources and books. 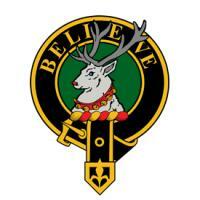 There was a Santa Claus Oath! I had no idea all that was out there! In that process I found ClausNet - and I am glad I did!" Drosselmeyer: "That's another question that limits the answer. There is an awful lot to like about ClausNet. 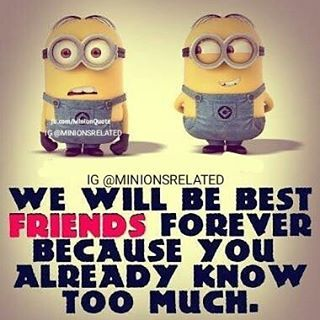 I have made some great friends and great contacts. I was given good advice about how get ready for Santa school. 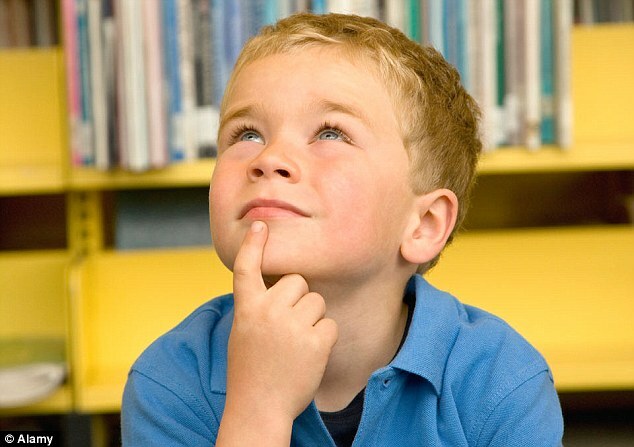 I have found great information on how to answer many of the questions that kids ask Santa while on his lap. I have learned a lot - and am still learning. Did you know there was a whole thread on how to make paper snowflakes? That was fantastic! The more you take time and wander around the more you find! There is an awful lot in the archives! If you ask a question you get a lot of good insight from others who have already dealt with your situation and have insight - that is powerful. And there isn't a rivalry - everyone is here to help each other and promote a positive image of Santa. Another wonderful thing is that the members support and encourage each other - they will share concerns and requests and pray for each other! I don't think I have ever found that in any other group I have been involved with - there is a tangible level of brotherhood here that makes you part of the family. Of course, there is an amount of friendly antagonism - I am guilty of that - but I have made some good friends and enjoy the banter. It’s nice to slip back to my desk from time to time during my work day and take a minute or two and pop on the site, even just to ‘Count to a Million.’ I appreciate that ClausNet is here - I don't think I would be where I am today without what I have gained from this site." Drosselmeyer: "I can't answer that question. If I tried, I would end up leaving someone out - not because I meant to, but because there are too many great Santa's out there. As soon as I joined ClausNet, Schwindy reached out to me. Felix Estridge offered me some great advice on how to approach going to CWH as a newbie, and then also offered to help me with beard whitening. Duane Cooper and his wife befriended me at CWH. Bruce Geron took me under his wing and encouraged me to get singing again. Jerry Owens also took time to share with me a lot of history about the Oath (and how to properly carry my pocket watch!) Eileen Strom has been very patient and helpful with several projects. 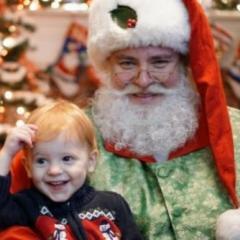 Michael Rielly gave me good advice on how to incorporate Santa into the ministry. Of course, I have to give due credit to my wife Dawn, without her volunteering me way back when I wouldn't be here now. I could keep going. There are an awful lot of good folks who are genuinely interested in helping others grow in their portrayal. I am thankful to you all." Drosselmeyer: "Be patient. Breathe. Have fun. It's going to be OK. 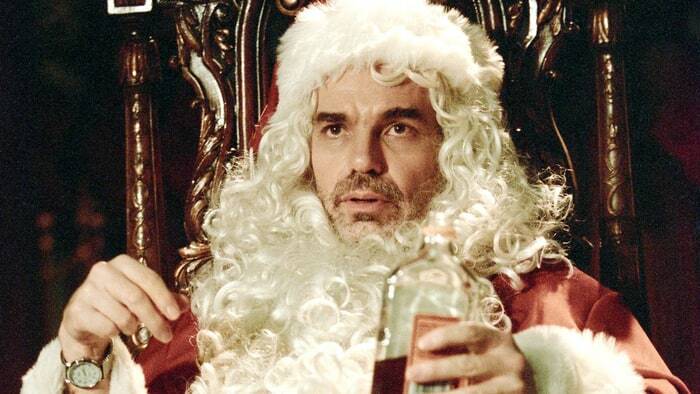 If you are approaching your Santa from a foundation of love and joy, you will be fine. We all make mistakes, and we all learn from them. That's OK. 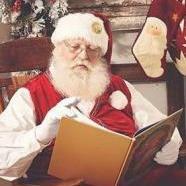 There are a lot of very talented and experienced Santas and Mrs. Clauses who are more than willing to shepherd you and help you grow in your character and portrayal. Constructive criticism is not bad - accept it and learn from it. Never stop learning. Never stop growing. Never stop caring - that is what makes wearing the red suit special." Drosselmeyer: "I think I have babbled on quite long enough. But I would like to say thank you for ClausNet. It has been a source of inspiration and a breath of fresh air. 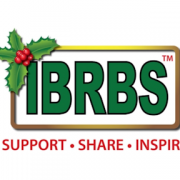 I would not be where I am today on my Santa Journey without this site and you my friends. I will not ever be able to pay you back, but will do my best to pay it forward." Thank you Doug! 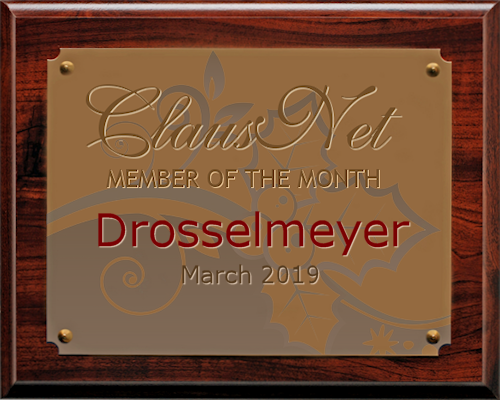 Everyone, please join me in congratulating Drosselmeyer, our ClausNet Featured Member of the Month for March 2019! Congratulations & welcome to the Member of the Month club! Unbelievable, couldn't have happened to a more unbelievable individual. The selection for March 2019! Welcome to the club and a great CHOICE! Congratulations and welcome to the MoTM club! 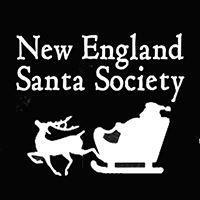 I am sure that you will enjoy mentoring many newbie Santa’s at CWH this year. Congratulations, Doug! Welcome to MOTH. 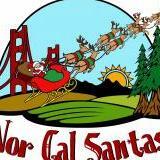 Congratulations, Santa Doug, on a well deserved honor! Congratulations Doug on this wonderful achievement!!! Congratulations and welcome to the MOTM Club!! Congrats, @Drosselmeyer; and well-deserved, too! You have been a blessing and an inspiration. Well deserved Congratulations to you! The Immortal Nicholas by Glenn Beck- Will be my next book I read, thank you for bringing it up! Keep on Keeping on with being the blessing so many people need to see in action in this world! Congratulations! I enjoyed the interview. 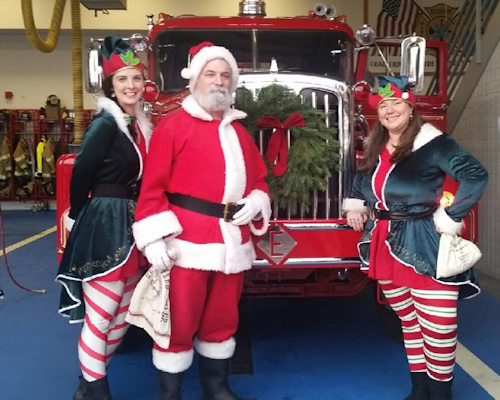 I'm also the Santa for our local Volunteer Fire Company. It's where I started and it is still my favorite event of the year. Quite an article, Dross. Good for you! Have you some mysterious way found more than 24 hours in a day?